On December 11th 2017 evening, I went to see a play titled Left in an event called English Nite and watched the performance of my boyfriend there as one of the actors playing the drama. 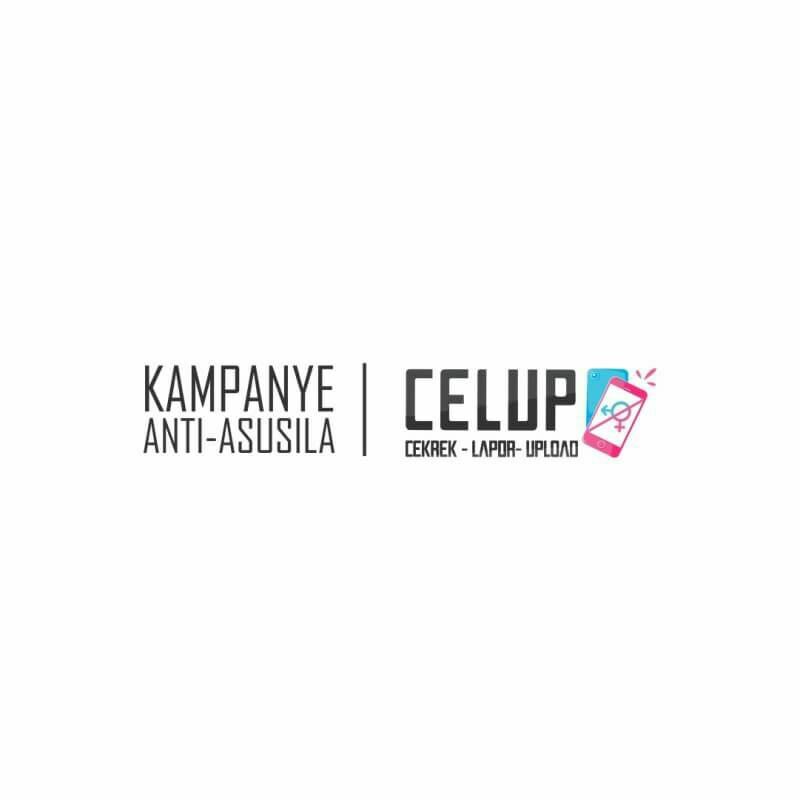 The event took place at Cak Durasim Cultural Center in Surabaya and was fully held by undergraduate students majoring in English Literature — English Department Students Association (EDSA) of Universitas Airlangga (UNAIR). The play was produced by Derryl Haristianto, Risky Amalia, and Tita Rismayanti; directed by Hanif Naufal (my schoolmate in elementary school! ); and written by Dida Hilman and Adhe Lisa K.
The story revolves around the main protagonist, Will — an only child whose mother has died of alleged suicide when he was twelve — and his everlasting trauma caused by the incident. Will who lives together with his father, Ben, then lives his life differently after his mother, Nina, has gone. Will, whose mother apparently died from suicide when he was 12, is now living only with his father, Ben. His temperament has changed since his mother’s death, and he frequently suffers from episodes of trauma. During a New Year’s Eve party in his campus, he gets to one of those episodes and is helped by Jane, the popular girl. Shortly after, the two get tangled in a relationship. Jane’s friends warn her not to hang out with the mysterious and weird guy. One of Jane’s friends bullies Will and insults his mother. This triggers Will into having an episode. Will kidnaps the guy and ties him. He intends to kill the guy for making fun of his mother. Luckily, before Will slices the guy’s throat, he is again visited by his mother’s ghost, who reveals that her death is actually not from suicide. Will’s friends, who have known him since children, are beginning to worry about their friend, who don’t talk much to them about his condition. Jane begins to suspect on her own that Will’s mother didn’t die from suicide. She suspects that it’s actually Will that killed his mother. Ben knows about this, and invites Jane to a meeting to discuss the truth. When the two meets, Ben reveals that it is him who has murdered his wife. Not wanting the truth to spread, Ben shoots Jane dead. Will suddenly breaks into the scene, and after finding his girlfriend dead, shoots his dad during one of his traumatic episodes: first on his knee, and then on his chest. Will’s friends, who are worried about their friend not showing up for their appointment together, finds him on the scene. Still in his episode, Will tries to kill his friends before killing himself. Now crying over their dead friend, they don’t realize that Ben is still alive and is rising to get to them. You can see the trailer for the play here. What motivates me to write this review is because the play's story reminds me of one of my most favorite movies of all times, Memento (2000). Both stories got something to do with the main protagonist's suppressed memories from their bitter past and the main protagonist's altered consciousness related to those suppressed memories. A mentally unstable slash borderline insane male main protagonist gets visited by the spirit/ghost of his dead parent (or the hallucination of the main protagonist, I suppose). The difference is, it's the mother who's dead in the play instead of the father. The lead character's love interest gets dragged into his dark past and is killed because of it. In the end, all the main protagonists die (or seem like they do), leaving their friends to be alive at the scene (albeit for a little while in the play). So, what's good about the play? The trailer would be the first thing I'd mention! It's definitely my cup of tea — it brought up my excitement for the play and made me look forward to actually seeing the play. It was nicely executed too, especially from a cinematic standpoint. It's short, the visual is simple and doesn't look too extra, yet effective. I certainly fancy the way the narrator narrated the trailer. He has successfully evoked certain emotions related to the main story which revolves around a tragedy: tragic emotions. Great voice, great tone, great pacing, and there's just enough pause between each line; the much-needed silent moments executed brilliantly. All of those are supported by a matching choice of background music which helped setting the vibe. Also, quoting Aristotle's Poetics... he's said to treat the defining experience of tragedy as involving a concentrated surge of pity and fear — exactly what was elicited by the trailer, and exactly why I looove it. Moreover, it was released when there was just enough time before the actual D-day to build up the audience's (and potential audience's) anticipation; definitely a huge improvement from the previous English Nite drama. Kudos to this year's publication crews! Additionally, regarding the actual play... the play was so intense — all the lighting, sound effects, and blocking were utilized really well to support the play and hence intensifying the whole experience. Seriously, they were good. The mise-en-scène — or in this case of a play, staging — was good as well! So, kudos to all the staffs behind the scene that supported this play. You guys have done well, and I must appreciate that. Also, remember what I said about how Left reminds me of Memento (2000)? Well, the plot twists and the didn't-see-it-coming factor within the story are arguably the ones that make me appreciate this play even more. There are three plot twists from what I could see in the play; one is the fact that the death of Will's mother wasn't a suicide after all — rather, a deliberate doing of someone. Then, both the second and the third are related to the identity of the real killer of Will's mother. The second plot twist is a speculation that Will might be the killer of Nina, and the third plot twist is the revelation that Ben, Will's father, is the actual killer. Although I in the end could indeed see it coming, but it's nice to finally see something out of ordinary and isn't straightforwardly predictable. So, yay for that! Oh, and I love how the romance subplot isn't taking over the main premise of the story about Will's suppressed memories caused by his trauma due to the tragedy happened in his past! I myself am not too big of a fan of sappy love stories that center around romance and let it take all the spotlight. Left satiated my said taste by not overwhelming me with the romance subplot that's present in the story, and instead it has successfully kept the protagonist's trauma (which is supposed to be the main premise of the story) staying in the spotlight. Last but not least, the casts' performance was quite nice in general! There was no unwanted silent-moments; all casts seemed to have memorized their lines pretty well and the deliveries were also generally good. The chemistry between the casts were showing as well, which made everything feels natural and authentic. The plot twist's executions could've been better. Remember the back-and-forth speculations about who pulled the trigger that killed Will's mother, supposedly being the second plot twist? Now, there shouldn't be an obvious build-up to the said plot twist — it would've made the moment of revelation much more intense. I remember Jane and another protagonist were chatting about their speculations as of who actually killed Will's mother, then Jane explicitly mentioned a name: Will. It immediately felt like an anti-climactic moment. In my opinion, the moment when the second plot twist was unraveled would be much better if the dialogues were tailored so that they would only reveal the hints about the killer without explicitly mentioning a name. Although of course, made in a way that the audience would still understand it if they ever decided to put together the previously laid-out hints. Kind of how Detective Conan manga lay all the evidences leading to the killer without revealing an identity until the very last moments, I guess. The shocking factor would then come as more of a, well, surprise. But then the third plot twist was pretty sudden and unforeseen, even though it was still a little bit predictable for me. But well, it's better since there was no name mentioned. And then there were some moments when the casts spoke too loudly on the microphone, some sound controls might be needed in the future to prevent this from happening. But yeah, all those technical errors are definitely errors that could be fixed and prevented in the next play. All in all, I have to say that I'm liking this play! 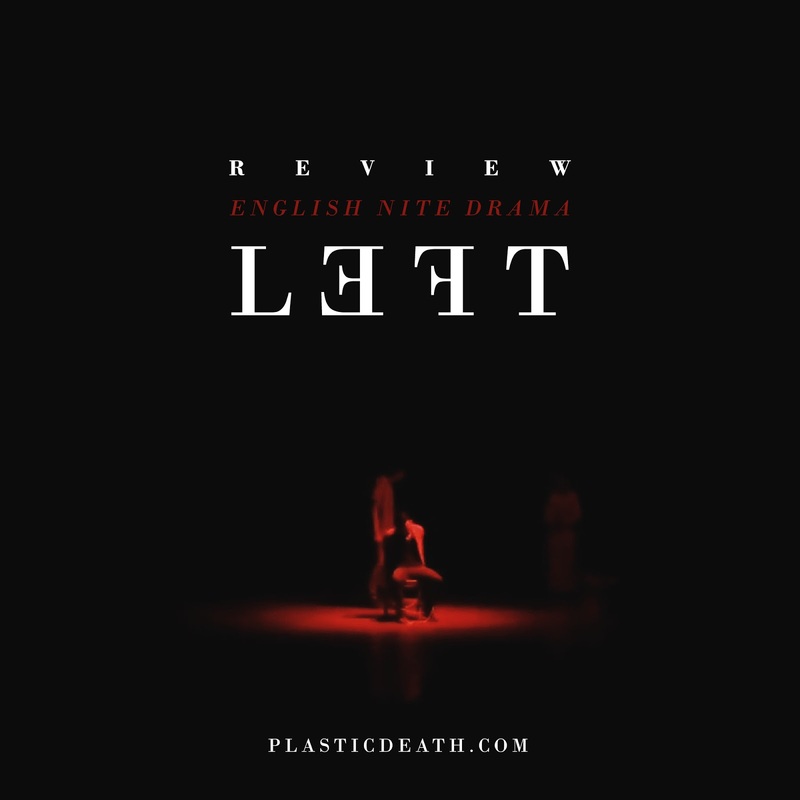 Sure, there might be lots of rooms for improvements, but as a verdict I must say that Left is a refreshing play from all those teenlit romance stories and brought an intense story to the table; it has successfully stolen the gaze and taken away the breath of the audience. 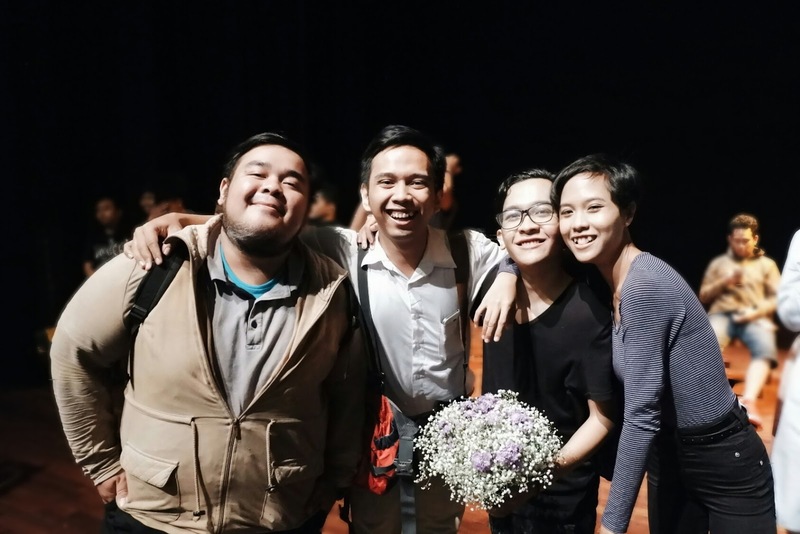 My boyfriend initially wasn't so confident in the play — he said it after the play was finished, because he only got to judge everything from merely the script as a cast. But then I said to him that it's so much more than that! Especially when I was watching from a different point of view: as an audience in front of the stage; whilst he judged everything from the backstage viewpoint. It's so much more than the script; it takes everything from lighting to music to staging — all joining forces, supporting the main story which was previously present only in the form of a written script before made into reality. And the end result is quite nice! Moreover, I have to say that this play is a huge improvement from the previous English Nite drama, in my opinion. So kudos to everyone that was involved and made this play possible! To all the director, the casts, and the crews... this play wouldn't have happened without all of you guys. So thank you! Thanks for the heartbeat-inducing play! I'm definitely looking forward to seeing more of English Nite dramas in the following years to come. And thanks to my friends Nanda and Andre for accompanying me watching this play!